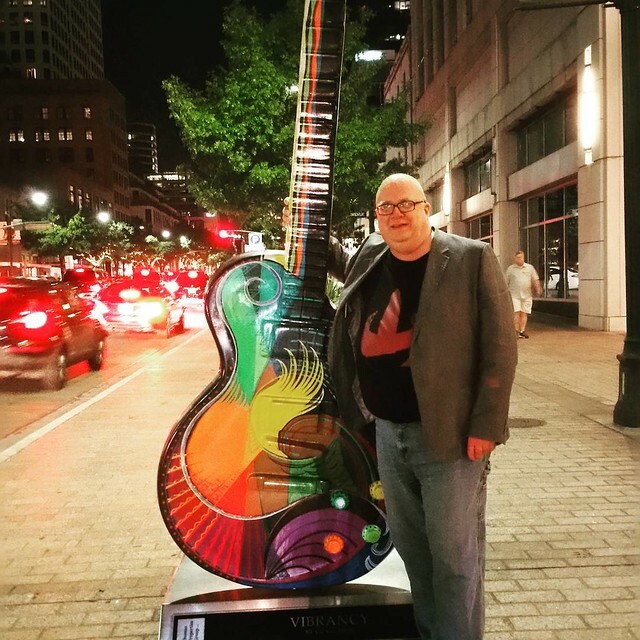 Mason West: Donovan in Austin, 24 September 2016. Donovan, Washington, 2007. Photo by Urbankayaker. Released to the public domain. 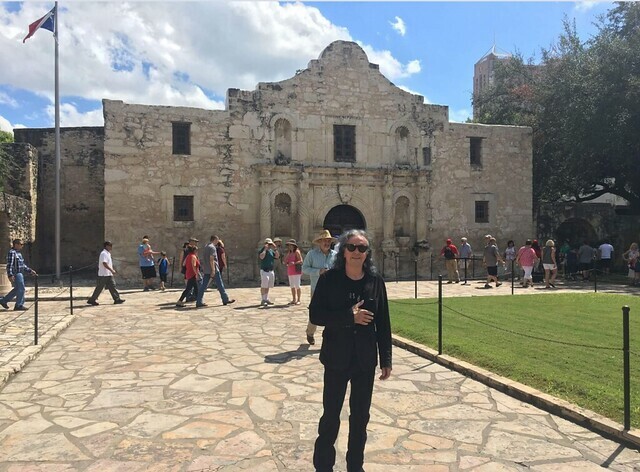 Donovan at the Alamo, 23 September 2016. Donovan started with several songs that he recorded before he caught my attention. These included "Remember the Alamo," first recorded in 1964 and certainly appropriate for the Texas leg of the tour; "Little Tin soldier," based, Donovan said, on a Hans Christian Andersen Story; and "Guinevere" (not to be confused with the Crosby, Stills & Nash song with the same title). I recognized "Catch the Wind," which I had actually thought was a Dylan song. Though the melody was influenced by Dylan's "Chimes of Freedom," it's a Donovan song. To further confuse the casual listener, the song was recorded by dozens of other popular recording artists. The stage was bathed in solid colors, mostly red, during the music, but went to a warm natural glow during the banter between songs. Donovan sat on his elevated platform on the stage and told his stories about songs and how they came to be written and about other Rock personalities who had influenced him or that he had influenced. These stories steadily spun a feeling of intimacy with the audience. Who can't feel the child-like wonder and charm in these lyrics? If I couldn't, I would at least know something important had been lost in my life. The Paramount, which serves as both a concert venue and movie theater, just celebrated its centenary anniversary last year. Woody Guthrie, an early influence on Donovan, also played the Paramount Stage many years ago. The theater's seats seem to be from Guthrie's time. The theater celebrates many fiftieth anniversaries this year. Donovan's tour celebrates the fiftieth anniversary of the release of Sunshine Superman. Monkees, comprising Mickey Dolenz and Peter Tork, are also coming on a fiftieth anniversary Tour. Priscilla Presley is coming to talk about "Elvis & Me." Fellow Monty Python members John Cleese and Eric Idle are also coming, and while they're not proclaiming an anniversary—the BBC didn't start airing Monty Python's Flying Circus until 5 October 1969, so they're youngsters by current standards of half-century nostalgia—they'll still appeal to those of us who have silver hair if we're lucky enough to have hair at all. The PA played Beatles' music like Rubber Soul before the concert and during intermission. A lot of Donovan's stories between songs focused on his part among The Beatles, The Rolling Stones, and Bob Dylan, and it seems that he is asserting his rightful place in the history of 1960s, mostly British, Rock. After the song, Donovan added, "In 1966 and 1967 everything burst into color. I wonder why." There was a general muffled laughter. During that period every band released its most psychedelic albums—with the Beatles it was spread across both Sgt Pepper's and Magical Mystery Tour. For the Rolling Stones it was Satanic Majesty's Request. And for The Who, it was Magic Bus. Donovan's "Hurdy Gurdy Man" draws me into the psychedelic feeling, like a contact high shared with a thousand people, and he followed this with "Sunrise Superman" and "Season of the Witch." Then Donovan told us a story about how, after a certain song became a hit, people keep coming up to Donovan and saying "It doesn't work." They were referring to smoking banana peels. People were desperate to try anything that was legal because oppressive governments were handing out sentences like twenty years for possessing a single marijuana cigarette. It was a funny story and the perfect lead-in for "Mellow Yellow," which ended the second set. Donovan's encore song was his masterpiece, "Atlantis," which roused the audience in one last fevered pitch before the magical evening was over.